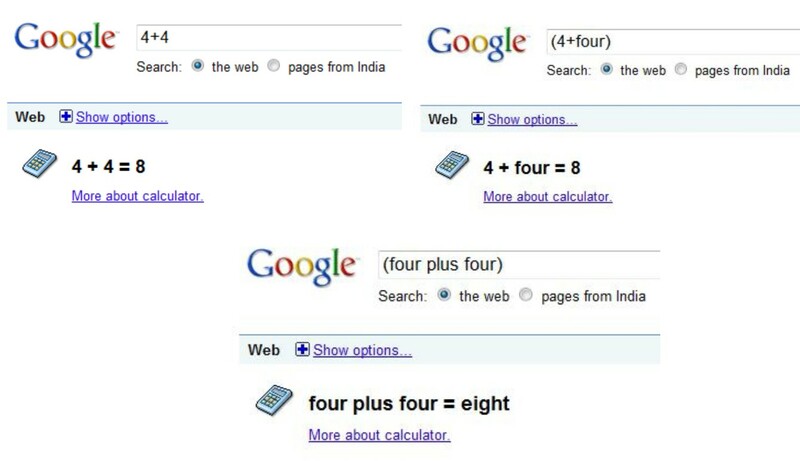 1) Google can be your calculator: Type a math problem into the search box and Google will compute it. You can spell out the equation in words (four plus four), use numbers and symbols (4+4) or both (4+four). Other than addition, you can do minus, divide, multiply, percentage etc. 2) Unit Conversion : You can use Google search to convert between many different units of measurement of height, weight, and volume among many others. 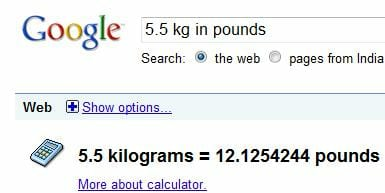 So when you want to know what is the equivalent pounds of 5.5kg you can view it by entering (5.5kg in pounds) in the search box. You can also try out other unit conversion too as you want. 3) Currency Conversion : As the name suggests, Google can tell exchange rates between any currencies. For example, you want to convert Euro in US Dollars, type (euro in usd). 4) Search with keywords in a given sequence : If you want to search Google in the same sequence as you entered in the search box, then double quote the search string,ex: “the key to success”. 5) Find local time of any city in the world: If you want to know the current time of any city, just type “time” before the name of the city. 6) Synonym Search: If you want to search not only for your search term but also for its synonyms, place the tilde sign (~) in front of your search term. 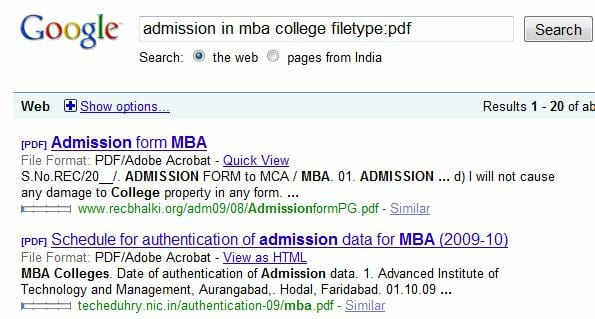 7) Search based on File Type : You can search any keyword in any of the File Type format like DOC, PDF, XLS, PPT etc, just type for example “admission in mba college filetype:pdf”. 8 ) Exclude specific word: You can exclude specific keyword with the minus operator(-) like “Exclude specific keywords with the minus operator like new books -amazon which excludes all results from amazon site. 9) Track Flight Status: Enter the airline service name and flight number into the Google search box and get back the arrival and departure times of that particular flight. 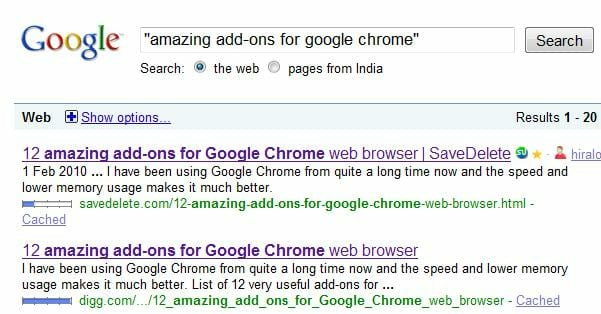 10) Make Google your quick dictionary : Type “define” before any English word into the Google search box and get the quick definition at the top of the search results. 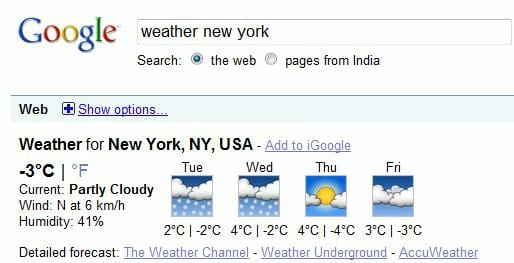 11) Get the weather status of any city in the world: Type “weather” before any city name or city code and get the weather status of that city at top of the Google web page.